Dispatch from the SPC: Affordable Living: What’s transportation got to do with it? Note: This post is part of an ongoing series of dispatches from the Seattle Planning Commission. 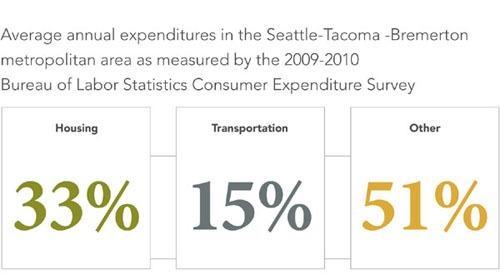 Not surprisingly, housing is the largest cost for households in the Seattle area, yet transportation also accounts for a substantial chunk of our spending. On average, about 33 percent of what we spend each year goes to housing, while another 15 percent goes to transportation. That’s close to half the amount we pay to keep a roof over our heads. As the Planning Commission details in its recently released Housing Seattle report, the share of households with unaffordable housing costs has increased substantially since the 2000 Census. In order to reverse this trend, Seattle must advance “affordable living” on a broader level. Improving access to affordable transportation and developing a citywide Transit Communities policy are important steps toward making living in Seattle affordable to a greater number of people. The American Public Transit Association calculates that a two-car household in Seattle can save an average of $12,000 per year if they give up one of their cars and one driver commutes via transit. That’s real money that could go toward housing costs instead. Maps created by the Center for Neighborhood Technology show that households in locations with higher housing densities and levels of transit service tend to have lower transportation costs. Our report found that households with low incomes are under the greatest strain from both housing and transportation costs. In order to address both issues, one of the Planning Commission’s key recommendations is to build most new subsidized housing within transit communities. In a transit community, residents can easily walk, bike, or take transit to get to work, school, and more, and they don’t have to transfer twice and miss dinner with their kids to do it! Neither APTA’s nor CNT’s methodology is perfect. Still, a combination of data and personal narratives like those featured in Housing Seattle make a compelling case: transportation policies and choices have a big impact on determining who can afford to live and work in Seattle. Let’s pursue a citywide Transit Communities policy, increase access to transit and invest in our transit communities, and help keep Seattle open to all. Diana Canzoneri is the staff Demographer for the Seattle Planning Commission and was the primary researcher and analyst for the Commission Housing Seattle report. She analyzes census and market data and provides demographic analysis related to comprehensive planning, community development and long-range planning for the Commission as well as City officials and departments. That $12k/year is a really big deal. Over a 30 year mortgage (assuming a 5% interest loan and 3% inflation) that’s about $265,000. This means if you can move to a location where you can give up one car, the home can cost an extra $250k and still be a better deal than the suburban alternative. Of course there’s still the issue of qualifying for a loan large enough, but you can start small and upgrade over time thanks to the money you save. And unlike spending $12k a year on a car, at the end of those 30 years you still have most of that money – it’s invested in your home.